What: Coming off bitter losses, the Empire and the Crush meet in the IFL's version of Thursday Night Football. Note: This game, originally scheduled for Friday, May 19th, was rescheduled due to the ECHL's Colorado Eagles advancing to the Western Conference Final. The Empire are 7-4 overall, 3-2 on the road and 6-2 in conference play. Spokane is coming off a 35-49 home loss to the Arizona Rattlers on May 12. They are averaging 44.0 points per game (6th in IFL) and are allowing 41.2 points per game (4th). The Empire are tied for first in the Intense Conference. The Crush are 2-9 overall, 1-4 at home and 1-8 in conference play. Colorado is coming off a 37-38 road loss to the Salt Lake Screaming Eagles on May 12. They are averaging 37.8 points per game (9th) and are allowing 53.2 points per game (10th). The Crush are fifth in the Intense Conference. With five games to go in the 2017 regular season, the urgency for the Spokane Empire to finish the season strong as high. The Empire enter Thursday night’s game with the Crush on a two game losing streak, dropping back-to-back games in which they were within striking distance at the half only to let the game get away late. Even with a short week, Spokane cannot dismiss the last place Colorado Crush (2-9). While the playoffs appear unlikely for a Crush team that has struggled throughout the majority of the season, they’re a team that should not be taken lightly. Colorado has shown the ability to beat a top quality team, as evidenced by their stunning 77-73 win over the Wichita Falls Nighthawks on April 21. The timing of Spokane’s 1-2 record over the last three weeks has tied in with several key losses to the team; K Craig Peterson and DB Adrian James both signed contracts in the CFL with the Hamilton Tiger-Cats and BC Lions, respectively. The biggest loss came last week when Nick Haag, the leading voice and motivator on defense, signed a tryout with the New York Giants. LB Andrew Jackson, who had performed well on the defensive line, filled in well for Haag, but a pectoral injury to LB Pasquale Vacchio left the Empire’s defense in a vulnerable state. In their 35-49 loss to the Arizona Rattlers, the Empire’s defense was gashed for 87 yards and 3 TDs running game, as the team was forced to play with 4 DBs to cover the loss of Vacchio. That should not be an issue this week, as Haag was recently re-activated to the active roster. Offensively, Spokane showed signs of life; Charles Dowdell (144 of 253, 1,615 yards, 39 TDs, 14 INTs) played better in the loss to Arizona, throwing for 145 yards and 5 TDs with no interceptions. However, the glaring weakness of the team was the offensive line. The Empire found success in running the football with RB Trevor Kennedy (6 rushes, 34 yards) but the line struggled with protecting Dowdell, as he was sacked 6 times for a loss of 48 yards. The offense appeared to counter the Rattlers’ defensive pressure with success running the read option, and could be a key to the Empire’s success against a Colorado defense that has struggled to get to opposing quarterbacks this season. Colorado’s 8.0 sacks this season are the second worst total in the IFL, and could be much needed therapy for an Empire team that needs to give its QB time in the pocket. RB Trevor Kennedy (48 rushes 185 yards, 5 TDs) had a strong showing against the Arizona Rattlers last week, rushing 6 times for 34 yards and averaging 5.7 yards per carry, but the Empire went away from rushing the football in the game. Facing a Colorado rushing defense that ranks second to last in the IFL, giving up an average of 90.6 yards per game, is an opportune time to take advantage of Kennedy’s rushing ability. Presenting Kennedy with more rushing attempts, and using more of the read-option, will greatly benefit Spokane in the long run. With Dowdell and Kennedy running the ball on opposing defenses, it can be a benefit for an Empire team that needs to regain high confidence in its passing game. In spite of the troubles in pass protection, the Empire’s wide receiving unit has done a good job this season. Bryan Pray, the “old man” of the receiving corps, leads the team in all 3 major receiving categories with 45 receptions for 479 yards and 14 TDs. After a slow start to the season, he’s caught 2 or more touchdown passes in 6 of his last 7 games. His presence has opened up opportunities for Devonn Brown (35 receptions, 385 yards, 9 TDs) and plenty of scoring chances for Samuel Charles (23 receptions, 331 yards, 9 TDs). Recently, re-activated veteran Orlandus Harris Sr saw the field for the first time this season against Arizona, and could play a bigger role this week. Colorado’s passing defense has improved a bit during the latter stages of the season, but an established run game can leave the Crush defenders prone to giving up the big plays. That success burned them in the first meeting in Loveland back in March, and could present a confidence boost for Spokane’s offense, which has averaged 36 points or less in 5 of its last 6 games. Lower scores are more common in the IFL versus the AFL, but for a team with Championship aspirations, the Empire needs to get more points on the board. With the loss of Pasquale Vacchio, Spokane’s talented defense is taking a hit but must overcome the adversity. Andrew Jackson, the team leader with 72 total tackles, has spent the majority of the season on the line due to the presence of Haag and Vacchio. With Haag earning a roster spot with the New York Giants, Jackson’s now the man in the middle. He’s had a good season so far, with 45 solo tackles, 4 sacks, 9.5 tackles for loss, and a fumble recovery. With the return of Haag to the Empire, Jackson or Haag will likely take over Vacchio's spot in covering down the field. 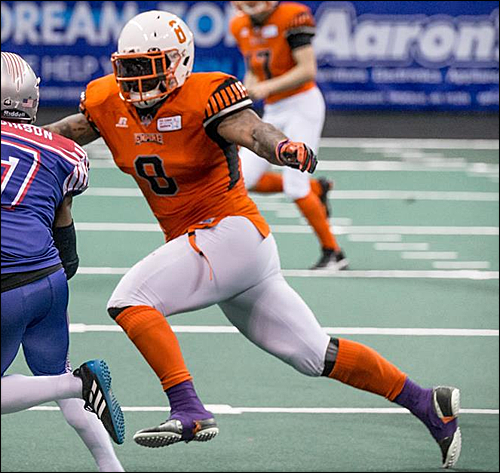 With Haag back on the active roster, it could be a long day for Crush RB Josh Ford (271 yards, 4 TDs), who hasn’t been lighting the world on fire rushing this season. Shutting down the Crush’s running game will be key, especially with the new faces covering the middle. That means the Empire’s defensive line has to step up, shut Ford down, and apply pressure on Crush QB Sean Goldrich. J.D. Griggs (34 total tackles, 8.5 sacks, 13 tackles for loss), O.J. Mau (10 total tackles, 0.5 sacks) and Harold Love III (21 total tackles, 1 sack, 3 tackles for loss) have to bounce back from last week’s game, in which they failed to generate pressure on Rattlers QB Cody Sokol. Getting pressure will be critical, especially if Spokane wants to keep pace with the Rattlers in the Intense Conference. The defensive backs for the Empire have to be relieved that Goldrich will be the expected starter over rising star Liam Nadler. Unlike Nadler, Goldrich has a worse completion percentage, a lower yard per pass average, and he’s thrown more interceptions. Getting pressure on Goldrich could lead to ill-advised throws; even with talented receivers such as Kyle Kaiser (41 receptions, 522 yards, 15 TDs) , Chris Gant (23 receptions, 273 yards, 8 TDs), and Lovie Rose III (30 receptions, 354 yards, 4 TDs), Goldrich’s inaccuracy could lead to interception opportunities for Spokane’s defensive backs. Look for Tyree Robinson (58 total tackles, 2 INTs, 5 pass breakups) to disrupt Colorado’s receivers. John Hardy-Tuliau (58 total tackles, 3 INTs, 3 pass breakups) was inactive last week vs Arizona. He's likely to be active again this week, as the team released Robert Brown on Tuesday to give more opportunities to the younger defensive backs. With Brown gone, look for DBs Antoine Tharpe (7 total tackles) and Qua Cox (3 total tackles) to step up and contribute for the Empire. The Crush find themselves at a crossroads. After a thrilling 77-73 win over the now 9-2 Wichita Falls Nighthawks, Colorado has dropped three straight, including two to their fellow Project FANchise owners, the Salt Lake Screaming Eagles. Last week's game ended in a 38-37 last-second loss to Salt Lake when it appeared if the Crush could steal their second win in Utah. It was a disappointing loss for Colorado, as it had just seen the Screaming Eagles win their second game of the season in Loveland the week before. That was in Week 12, and the Screaming Eagles dominated that game in every facet. In fact, it could be claimed that the 64-41 final outcome was not even as close as that score would seem to indicate. Salt Lake held a 42-17 lead early in the third quarter. The Screaming Eagles led by 31 points within the last 30 seconds when the Crush's Daniel Lindsey returned a kickoff 42 yards for a a touchdown to account for the final score. Last week in Salt Lake, each team made some mistakes. Colorado fell behind 10-0 in the first quarter, but stormed back with 17 straight points. 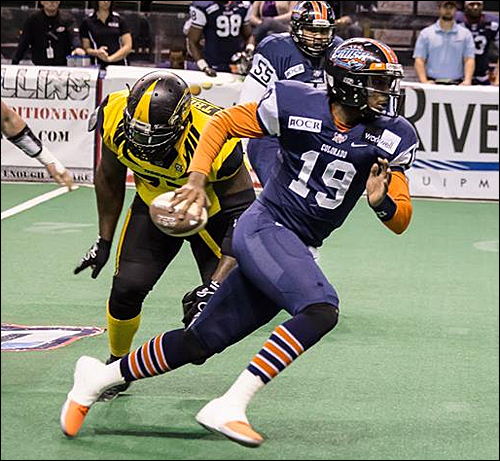 The Crush outscored the Screaming Eagles 31-12 in the second and third quarters to take a 31-16 lead at one time. Of course, in the Indoor Football League, that kind of lead is not insurmountable. The Screaming Eagles came back with a pair of touchdowns, and converted on two-point conversions on both of them. The second, as time expired, was a pass from Salt Lake quarterback Verlon Reed to Devin Mahina which gave the Screaming Eagles the win. So now, like in the past two weeks, the Crush face the same team the next two weeks. That is a match up this week against the Spokane Empire Thursday night, and then next Friday. The Crush will be at home for this one and on the road in Week 15. Colorado has faced Spokane twice this season, falling 70-37 in the first meeting, and 36-24 in an excellent defensive effort in Week 9. The problem with that match up was the offense, which was largely stymied. The Crush were within two points heading into the final quarter, but surrendered a field goal and a touchdown, while not scoring themselves, in the fourth quarter. Liam Nadler helmed the Crush in that one, throwing for two touchdowns and rushing for one. Unfortunately for the Crush, that is about all the offense they could muster in the game. In that first game, the Crush fell behind 35-10 at the half and never recovered. Look for Goldrich to get the nod again as the starter, but Nadler could see some action if the Crush get off to a slow start offensively. Goldrich has completed 55.2 percent of his passes for 14 touchdowns and seven interceptions, despite missing a significant portion of the season. Josh Ford is the featured back, who is averaging 24.6 yards per game. He, Goldrish and Nadler have each rushed for four touchdowns on the season. Ford is also a formidable receiving threat out of the backfield. The receiving group is talented, with Kyle Kaiser being the leader with 15 touchdowns on 41 receptions. Kaiser, who has appeared in each of the Crush's 11 games this season, is averaging 47.5 receiving yards per game. Chris Gant is the big play guy, with 23 grabs for 273 yards and eight scores in eight games. Lovie Rose III has 30 receptions for 354 yards and four touchdowns. Derrick Morgan and Cardelro Jones lead a defense which has shown it can be effective, if not consistent. The duo has combined for 101 tackles, two interceptions and four pass break ups. Antonio Marshall has 43.5 total tackles and five pass break ups. In just six games, Ace Clark is pacing the team with 2.5 sacks on the season. Daniel Lindsey, who is likely to see some time on defense, can be potent in the return game, posting 578 yards on 26 kickoff returns and a pair of touchdowns. Facing the Empire is definitely a daunting task for the Crush, and they will need to step up on both sides of the ball in order to come away with the win. The Crush could benefit from a couple of big defensive plays, as well as a favorable bounce or two on special teams. 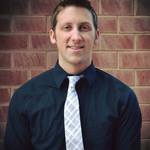 Empire HC Adam Shackleford on a disappointing loss to the Arizona Rattlers. "We're in first place, but we're fighting for our lives." LB Pasquale Vacchio on Rattlers RB Darrell Monroe's 87 yards and 3 TDs against the Empire's run defense. "Any time a team is running the ball on you it's a bit disrespectful." May 20 - Salt Lake City Screaming Eagles (3-8) at Arizona Rattlers (7-4), 6 p.m.
With the constant revolving door at QB for the Colorado Crush this season, this week's extra is taking a quick look back at last season, when the Crush found success with a backup QB by the name of Damien Fleming. A rookie with the Crush in 2016, Fleming began the season as the backup to starter Brandon Mitchell. When Mitchell went down with an injury in a 47-30 defeat to the Billings Wolves in Week 2, Fleming took over as the team's starting QB. Despite the team's 4-12 record, Fleming had an impressive rookie season. In 14 games, Fleming threw for 2,745 yards, 57 touchdown passes and 10 interceptions. 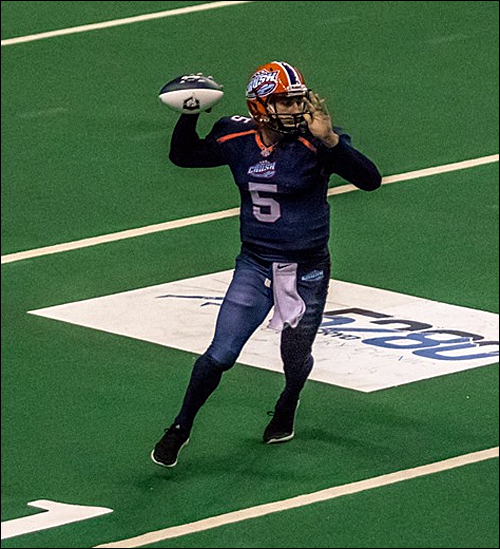 He ranked 2nd among all IFL QBs in average passing yards per game with 196.1 Fleming was also the Crush's leading rusher with 432 yards and 19 touchdowns. While IFL Offensive Player of the Year wasn't in the cards for Fleming, he was at least recognized by the IFL as the Week 11 Offensive Player of the Week. At that time, the Crush won their first game of the season against the Wichita Falls Nighthawks, 60-47. In the game, he completed 18 of 29 passes for 277 yards and 7 TDs while also adding 36 yards rushing and a rushing TD. In December 2016, Fleming was assigned to the Jacksonville Sharks, who moved to the newly formed National Arena League after spending seven seasons as members of the Arena Football League. This season with the Sharks, Fleming began the season serving as the backup to Tommy Grady, the 2012 AFL MVP. In the Sharks' fifth game of the season, Grady went down with a season ending ankle injury. Once again, Fleming has been thrust into the starting role for the Sharks, and he has not disappointed. So far this season, Fleming has participated in 5 games (2 starts) and is 2-0 with 463 passing yards, 9 touchdowns and 1 interception. Meanwhile, the Crush have seen at three different starters at QB. Between Sean Goldrich, Liam Nadler, and Aaron Aiken, the Crush QBs have combined for 1454 passing yards, 34 touchdowns and 13 interceptions. #47 - Nick Haag (LB) - Has been re-activated off the transfer list. He spent this past weekend in the New York Giants mini-camp. Brian Jackson (K) - Former AFL/af2 kicker. He played with the Spokane Shock (and Coach Shackleford) from 2008-2009 when they were in the AF2. Afterward, played with the Alabma Vipers (2010), Georgia Force (2011), Orlando Predators (2014) and New Orleans VooDoo (2015). Current kicker Brendan Garcia is a graduate student at Gonzaga, and it could be an "emergency kicker" signing based on availability. Will keep an eye on the transaction wire. #6 Robert Brown (DB) - Was released on Tuesday. Signed with the Nebraska Danger today. Reached out to a source that said Coach Shackleford informed Brown they were going with younger players in the defensive backfield. Robert will be re-united with his twin, Rob, in Nebraska. #7 Mulku Kalokoh (RB/KR) - Released Today. No word given so far. I'm guessing it could be to make room for Jackson, who would classify as a Veteran under IFL rules with 3+ years of experience, this week. Or maybe I'm totally wrong. Either way, lots of shuffling this week. Great write-up. Hopefully the Crush can come off the two losses to the Screaming Eagles and get their first win for Coach Marvin Jones. I think the Crush can stay competitive here. I look for this to be really entertaining. 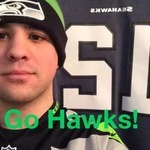 Incidentally, our Crush correspondent Drew will be at the game. Kasey is graduating from law school tonight, so Angi, Jessica and Heidi are going to be at the ceremony. It's going to be going on at the same time as our game. It's going to be an interesting night! Julie will be doing quarterly stats. I'll be updating the score updates and toss in some info on the Empire information if needed, afrats . Looking forward to running the thread, watching the game, and gobbling down game-time pizza. It's snowing in Loveland! Drew sent me these photos a few minutes ago The bottom shows the Budweiser Events Center. I've also gotten word that a few minutes ago Kasey walked up on stage and was handed her J.D. Law degree. I'm pulling up the pregame show now. On my way to pick up my pizza and listening to Larry Weir on the pregame show. Brian Jackson will kick tonight. First time since the 2009 ArenaCup that he has put on a Spokane jersey. Larry just had a nice interview with him. I like that he teaches at his kicking academy. This could very well be an interesting game with the inconsistency of both teams. The Crush D was good last matchup, and Coach Jones has done some good things with the Crush defense, so it does ultimately come down to the offenses. Can Goldrich realize his potential and can Dowdell play well? Only time will tell.